We can find any information we want in seconds, we can start a conversation within anyone in the world day or night and we can travel to anywhere in the world in hours. The need for speed in society seems to be increasing, yet as we seek out more speed we feel less. We’re the most connected we’ve ever been, YET in my mind we’re the least connected to ourselves. And I see so many women put themselves under constant pressure to achieve, to prove themselves and they chase happiness in things, stuff and achievements. Yet so many have lost the ability to hit pause, slow down and BE. They’re so busy DOING, that they’re not BEING … yet we’re ultimately human BEINGs. The power of hitting pause and slowing down is so obvious. It’s in the being present and enjoying real family time. It’s in the phone down and being with your loved ones. It’s in spending time in your life in your passions that completely absorb you. It’s in the pleasure of not having to be or do anything. It’s where new ideas live, mindful happiness and really being yourself. For me I believe, slowing down is fast … as you come back to clarity and focus on what you want. We tend to underestimate what we can do in a year, yet hugely over estimate what we can do in a day. 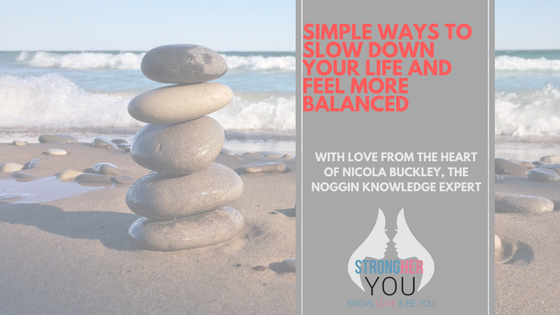 From talking to and helping over 500 women in the last year I know one of the BIGGEST struggle they have is hitting a work life balance. In fact, to most of them the work/life balance is a LIE. It seems unachievable and something that they’ll NEVER achieve. And they fear the slowing down and dropping plates if they did stop, they’ve made everything run from them being constantly on the go. So, when they stop family life stops. And with that you’re meant to stay cheerful and cope with ALL that is thrown at you. We’ve put an expectation on ourselves that we need to be superwoman and NEVER let any of the plates we have spinning drop. I know when I worked in corporate world I STRUGGLED to keep the focus on me when work was really demanding. I managed multi million pound launches for phone companies, so the nearer the launch the more manic business and pressure happened. So, ME first went out the window. I struggled to get to the gym or make the plans for the weekends with my friends. I’d just be focused on the launch and dotting all the I’s and crossing all the t’s. ^^^^ Meaning that I got less and less effective the more tired I got. It was really tough to have any sort of balance and that was with just me and no family to worry about. I still find it now, as I’m following my passion I could just work all day every day. THEN we have WORK which is not separate it’s an important part of our lives .. no matter how we feel about it. I hope you do something that fills you up that makes your heart sing BUT that isn’t all the women I speak to. ^^^ That’s ALOT to balance out, yet they’re all important to you as they make up YOU and your identity and you want to give all those roles the respect they need. So today I want talk about finding YOUR balance. Oh, and this is one I still work on for sure, I’m not perfect but today wanted to share what I have found works for ME and my clients. mapped out my year, with ease and flow really excited. down and take some time to be and ask yourself how do I feel? What do I want? What do I need? This is so important to understand your own feel good pace before you set off on any journey. Think of it like a run … you start off too fast, you’ll be gasping for air and have to stop, too slow and it’ll take you longer and longer. If you don’t want to find overwhelmed, stressed and on the floor gasping for breath because you started out too fast, don’t you think? Equally, you don’t want your pace to be too slow so that you get bored and frustrated and despondent about the result of your efforts either. Unfortunately, most journeys of change are started out at speeds that that either lead to frustration or overwhelm because you’re pushing too hard or you’re at someone else’s pace. ^^^ And both of these lead to what we don’t want. You call yourself a failure. You give up on yet another journey toward what you want because the pace wasn’t right for you, you convince yourself you’re a failure where in reality you’ve just not paced yourself. The reality is that there is no ONE optimal pace, they’’ change over time to fit with the ebbs and flows of life, sometimes slower, sometimes faster and sometimes at breakneck speed. But only if WE set the pace ourselves based on what feels great to US in that moment rather than having it forced on us by someone else or we’re trying to keep up with the Jones’s. It could be leaving at 5pm on the dot each day and logging on again at home. It could be having a person trainer twice a week and then getting up 30 minutes early twice a week to get your exercise in. Find what works for YOU and stick to it. Commit to making the changes you need to at a pace that is right for YOU. What feels GOOD and sits with your values? Let it flex and evolve as your life does so there might be times when you need to focus on WORK and then flex to focus more on HOME when your children more of your support. Sounds easy, but it never feels that easy. Whatever you’re doing focus on that MOMENT and be present. Give it your 100% attention and slow yourself down to enjoy it and get the benefit of that. When you’re at home BE AT HOME. When you’re at work BE AT WORK. When you’re training at the gym BE AT THE GYM. AND on top of that set boundaries. if you’re at your children’s school play, phone off and be there. The magic is in the moments and you don’t want to miss them. Try to keep the separation between REAL life and social media life. Technology can be amazing with this but also blurs boundaries, with phones now being ever present office of sorts. Use it to your advantage, dial into calls to save the commute on the days your children need you but don’t like it be the third person in your relationship. For example, you make around 50 decisions a week about food. How much time and stress would it save to preplan meals a few days at a time and bulk cook? Get your diaries out and get planning. A life you love only comes from a diary you love. To work so hard hitting that LIFE BALANCE you really need to LOVE what you do and your life. For example have you fallen out of love with work? Do you feel resentful and unappreciated? 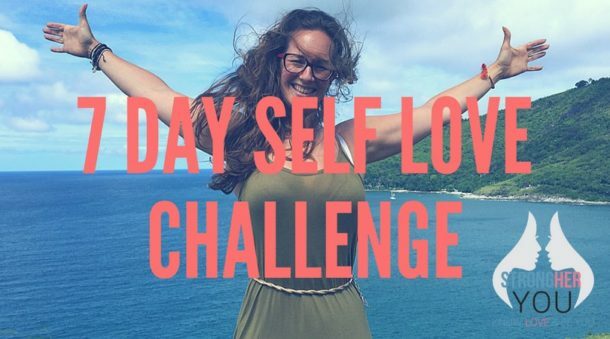 If you do, love and honour yourself enough to make a change. Refind that passion for life and that make you diary reflect it. What makes your heart sing? Do you look ahead with dread or excitement? For me I’ve found my purpose, I want all women to know they’re ENOUGH and that is what I LOVE. So, the time I spend on it is all worth it as it feeds my heart and love. BUT I can become completely absorbed in it.